Tourism, as every economist knows, is big business, arguably the biggest in the world today: the latest figures from the Secretariat of the World Tourism Organization suggest that the 664 million international arrivals worldwide in 1999 spent something on the order of $455 billion. Tourism is also the life and life's blood of Venice, Italy, and more than once, while sitting in Piazza San Marco on an August afternoon, we have felt like the better part of those 664 million travelers were passing right before our eyes. Venice may well be, for its size and population, the most touristed city on the planet, but even if it falls somewhat short of this dubious honor in terms of hard numbers, it still seems to enjoy a special status, in the mind of many, as the epitome of the tourist experience. Many of the visitors we spoke with in the course of researching this book have so learned to associate Venice with the touristic ideals of fantasy, pleasure, and—above all—romance that they seem to find it hard to conceive that this place exists or ever existed for any other purpose than bringing enjoyment to themselves or other outsiders. This is hardly a new reaction: Mary McCarthy once observed, "The tourist Venice is Venice . . . a folding picture-postcard of itself"; indeed, what we have found pervasively in the world-public mind is that there is no real Venice here. Although this is still technically a city (it has a government, after all, as well as city services, some residents, and even a university), visitors often fail to see or intuit such mundanity. Instead, they come here looking for the image that they have already formed of Venice—the vision of the Most Romantic City in the World. Like many another travel writer, Erica Jong advises her readers to hunt this ideal down while in Venice, and in no uncertain terms: "I recommend that you fall in love in Venice and pursue your love down the narrow calli, through the campi, under the sottoportici. If you can't snare a lover, Venice will surely provide one—even if that love is only the city herself. Venetian love affairs inhabit some ideal realm: they rarely prove durable when reality dawns. Perhaps that's the whole point." When they actually arrive, do the millions of tourists who come to Venice find Jong's "ideal realm"? They seem to, at least in the movies. At the climax of a recent Danish art-house film, Italian for Beginners, the protagonists, a troop of rather drab Danes, end up in Venice, and the city works its predictable magic. One couple, shy and quiet through most of the film, are so overcome with the passion of the moment that they grab an abandoned bed in some back alley and make wild love on the spot. If a viewer should happen to wonder—as we did—how the residents of Copenhagen might respond to finding two Italians doing the same thing in a back alley of their city, it is again enough to remember that for most of the world Venice is not a real city, with a real city's inhabitants and constraints, but a backdrop and a stage for one's gaze, emotions, and passions. Moreover, it is a place seemingly made for intrigue and romance, a labyrinth of narrow streets and waterways that positively invites transgression on the assumption that nobody is watching, or at least nobody who matters. Becoming the quintessential romantic city did not come naturally to Venice. Until 1797, when it ceased to exist as the Serenissima Repubblica, this was a city that existed primarily for practical purposes, not touristic—much less romantic—ones. It was built where and how it was simply to provide its residents with a secure place to live their social, political, and commercial lives. In earlier ages, visitors came here mostly for the same reasons that outsiders always come to cities—for profit, politics, or refuge. Those who admired the place usually did so more for its wealth, so brashly displayed on every side, than for its scenic qualities: many visitors were humbled, even intimidated, when they compared Venice's humming commercial activity, military force, and cosmopolitan crowds to their own, more staid and modest hometowns. This began to change in the late 1600s, by which time Venice was already well down the slope of its long decline. Visitors from England and France, particularly, began to turn their gimlet eyes on the whole range of products and pomp that had once made the city world famous, and realized that it no longer measured up to what was back home in London or Paris. Yet despite their scorn these foreigners kept coming, right into the 1790s, lured largely by those things that Venice offered that were relatively scarce elsewhere in Europe—a particular sense of style, above all, but also vice: gambling, prostitution, and perversion of whatever sort visitors required. Venice became the continent's brothel, but also, thanks to its limited scale and unique waterways, Europe's first theme park. By the time the collapse of the Serenissima Repubblica came in 1797, Venice was already well on its way to living off tourism alone. As such, we might say, it was perhaps the first postmodern city, selling no product other than itself and its multiple images to the tens or even hundreds of thousands of free-spending foreigners who came there annually. Much of this was a choice of the Venetians themselves, who during the 1800s were exploited and then abandoned by a series of outsider governments—first Paris, then Vienna, then Rome—cut off by changing patterns of trade from their traditional sources of wealth, and left with little to fall back on beyond their own proven ability to hawk themselves and their city to foreigners. A new form of tourism was soon there to buy their product. Packaged tours, built on the modest but pervasive resources of middle-class Germans, French, and British, and taking advantage of new rail links through the Alps, were soon flooding Venice with foreigners. Special trains might dump as many as ten thousand of these visitors a day into the city for special occasions. Before long, Venetians were beginning to tailor their own holidays, often of ancient vintage, just to suit the expectations and desires of these new visitors. From these earliest packaged tours to the industrial tourism of the present, visitors have come to this lagoon city looking for Romance with a capital R. In the nineteenth century this was above all a literary venture, as tourists sought (or competed) to plant themselves on the same spot that had once inspired Shakespeare, Goethe, Shelley, Byron, or Browning, and then read aloud the appropriate lines. Such interpretive efforts still continue, though now more through the play of image and representation with which Venice is presented to the world by the mass media in films, travelogues, and above all advertising. Today's Venice is still endlessly created and recreated in a feedback loop of tourist desire and demand, and even if the poetry has by now mostly given way to commercial tropes of gondoliers and Carnival masks, the city still satisfies with remarkable success the needs of those who visit. The intense affection that Venice arouses in the world public has brought its own price, however. Something like thirteen to fourteen million outsiders currently go there every year, overwhelming a town whose resident population at the start of the twenty-first century was barely sixty-five thousand. Venice is thus a city not just visited but actually inhabited by tourists: on average, there are no fewer than eighty-nine foreigners in the city at any given time for every one hundred Venetians who live there: the highest tourist-to-resident ratio in Europe, and nine times that found in, say, Florence. With visitors coming from every corner of the globe Venice might claim to be one of the great multiethnic cities of the postmodern world. Of course, all these transients do not really live there, at least not in the sense of residing there or paying taxes; yet in terms of human life and public activity, and certainly from the Venetian point of view, they are permanently there, all over town. Although each tourist may take up Venetian space for only a short while, in the aggregate they are there all the time: their transitory occupation might be called a flow, but for the Venetians themselves it appears as a continual, solid mass. Diverse though they may be and however much each may think that he or she is engaging with the city in a personal way, these tourists are still virtually all engaged in the same fundamental act. They are consuming—not so much Venetian culture, but rather the images of that culture, and consuming them, for the most part, as quickly as possible (over 80 percent of visitors stay less than a day). What Venetians tend to see of them is a homogenous flow: men, women, and children whom they refer to as "the herd," and who in the aggregate seem as undifferentiated as locusts or starlings. Some Venetians (about 40 percent of the total) do make their living tending this herd, selling it souvenirs, ice creams, plates of fritto misto, or corn to give the pigeons. Most residents, however, go on living there in spite of, rather than because of, the massive tourist presence. These unfortunates—pensioners, government workers, school children—can do little but suffer what the papers like to call their "days on Calvary," the ever more frequent occasions when sixty and sometimes even one hundred thousand outsiders try to cram themselves at once into what is, after all, a fairly small city. Tourists and Venetians, then, meet and jostle and try to get by in what is still one of the most beautiful cities in the world. The tourists come, many of them, with an ideal and a cliche battling in their heads, and hope that the ideal, their fantasy of Venetian Romance, will somehow win out, in the city where Henry James already was pouting, over a century ago, that "there is nothing left to discover or describe, and originality is completely impossible." Modern media assure them that this is certainly not so, however, and, if not true love, at least true fantasy (and good shopping) can still be achieved in the World's Most Romantic City. As one recent travelogue on Venice concluded: "Venice is one of those places that surpasses its own publicity. The canvasses of Canaletto and reels of celluloid can't sell it short. Being here is better than the dream." At the same time, the Venetians, ever older and fewer, keep up their struggle to remain in the city where their ancestors may have been born, but where they themselves are increasingly strangers, superfluous and often unwanted by the tourist monolith that has long since taken over. They write their innumerable litanies of complaint to the papers: about their difficulties in getting around among the crowds, about the pollution and disturbances brought in by the visitors, about the disrespect and ignorance they encounter every day. Those who get by the best seem to have learned simply to look right through the mobs, avoid the "hot" areas of town (although those are increasing in size every year), and live their lives in the early morning and at night. The development and the interplay between these two parallel realms—one of determined fantasy, the other stuck in a far too real world of overcrowding, decay, and discomfort—are the focus of this book. We have called our investigation a "cultural critique," one that presents the reader with a variety of approaches—sociological, historical, economic, and aesthetic—to a problem that is both deeply rooted in the past and quintessentially postmodern. In the process, we have attempted to set the Venetian experience into what is truly unique about this special city: the particular placeness of Venice. This has required us to engage with the multiple illusions that Venice projects of, and onto, itself, often tempting us away from our own academic disciplines and into the roles of travel writer and sentimental tourist. It has not always been an especially comfortable approach for a pair of social scientists, but we have come to believe that just beneath the pleasing but obscuring surface of this Most Serene City lies a social, topographic, and historical tangle of immense complexity, and that without grappling with the romance and fascination of Venice we could never manage to explain how we think that Venice does or does not work. To help us in the process of exploring this very complex city, we have taken advantage of Appadurai's notion of "scapes," perspectival constructs through which humans impose meaning on an environment. Unlike those travel writers who have traditionally divided Venice into some number of districts, sestieri, or (in one case) gateways, we have seen the experiential city as falling naturally into four of these scapes: Timescape, Landscape, Seascape, and, lastly, Worldscape, and we accordingly have structured this book into these four parts. Each scape implies different, if also simultaneous, ways in which the city has been imagined, constructed, and experienced, both by its visitors and its inhabitants. Each section has been divided in turn into chapters that explore what we take to be the scapes' most salient areas of contact and conflict, between the tourist and the localist vision of the city. Readers may notice a slight disequilibrium in this regard: "Timescape" has only two chapters, while the other sections are allotted three each. At some point even we, with all our enthusiasm for this project, had to admit that this book was getting too long. That, plus a certain refusal to give in to the tyranny of our own self-imposed symmetry, made it easier to drop a third history chapter, where we had originally planned to explore the artistic and aesthetic attractions of Venice for visitors in the eighteenth and nineteenth centuries. This is a topic that already has been well covered elsewhere, by scholars with far better art-historical training than either of us. But perhaps most importantly, we have come to realize that it is image, rather than art, that has long been Venice's primary attraction, whether for the Grand Tourists of two centuries ago or for the mass tourists of today. How this image has been both created and consumed has thus seemed the logical and necessary theme for this book. Inevitably, in the course of writing this work we have had to grapple with one question that for more than a century has uniquely shadowed this Most Romantic of Cities: is Venice dying? Some have claimed that it most definitely is not, backing this up with such delightfully specious logic as "A city that gives people ideas is not a dead city" (Angkor Wat? Machu Picchu? Atlantis?). Others say that Venice is not only dying but is already dead, killed by its tourist monoculture, pollution, and the inexorably rising tides. Historically, we know that Venice repeatedly has been declared comatose, if not quite deceased: on the ropes, breathing its last, sliding from view beneath the waves. Yet the city, to the extent that it is a city, has kept on, albeit with levels of tourists, rates of physical collapse, and heights of tides that would have been considered horrific there just a couple of decades ago. Somehow Venice keeps going, and every so often some significant improvements are seemingly made, interventions that may hold back the apparently inevitable, final collapse for a few more years. Not wishing to underestimate the flair and skills with which Venetians have approached the salvation of their city (nor the slowness with which they have typically carried out the work), we have tried to avoid snap judgments, especially since more than one apparent social or ecological disaster that we witnessed during the writing of this book seemingly had been resolved by the time of publication. We do believe, however, that while Venice clearly lives from the ceaseless flow of tourists through the arteries and veins of its narrow streets and alleys, it also slowly dies, at least as a Venetian space, through the continual congestion of these lifeways by outsiders. This project came out of the intersecting interests of a social historian and a social anthropologist. One of us brought to it his specialist knowledge of Venetian social history and his experience of Venetian culture, the other his anthropological interests in ritual practices and symbolic constructions. With this collaboration we hope to open up some new areas where our two disciplines can cross-pollinate; in particular, we hope to demonstrate an ethnographic continuity in the ongoing history of tourism in this most touristed of cities. The historian led the anthropologist through the texts and the topography of the city, in the spaces of which our conversations, observations, speculations, interpretations, agreements, and disagreements that produced this book took place. The anthropologist introduced the historian to the craft of interviews, to symbolic structures, and to the fine art of conducting one's field work in bars. In the end, though, Venice, the Tourist Maze was inspired by our own fascination with what is still a very special place—however it is constructed, or deconstructed. Despite the myriad representations of Venice, despite the libraries of books written about it, the city still shimmers—broken, unfixed, and probably unfixable—before all who those seek to experience it. "The tourist Venice is Venice," Mary McCarthy once observed—a sentiment very much in line with what most of the fourteen million tourists who visit the city each year experience, but at the same time a painful reality for the 65,000 Venetians who actually live there. 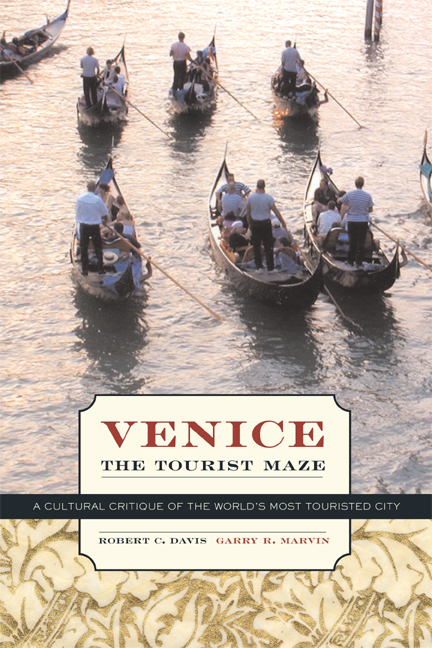 Venice is viewed from a new perspective in this engaging book, which offers a heady, one-city tour of tourism itself. Conducting readers from the beginnings of Venetian tourism in the late Middle Ages to its emergence as a form of mass entertainment in our time, the authors explore what happens when today's "industrial tourism" collides with an ancient and ever-more-fragile culture. Giving equal consideration to those who tour Venice and those who live there, their book affords rare insight into just what it is that the touring and the toured see, experience, and elicit from each other. Robert C. Davis is Professor of Italian History at Ohio State University. He is the coeditor of The Jews of Early Modern Venice (2001) and Gender and Society in Renaissance Italy (1998) and the author of Christian Slaves, Muslim Masters (2003), The War of the Fists (1994), and Shipbuilders of the Venetian Arsenal (1991). Garry R. Marvin is Reader in Social Anthropology at the University of Surrey Roehampton. His books include Bullfight (1994), Coping with Spain (1990), and, with Bob Mullan, Zoo Culture (1998).